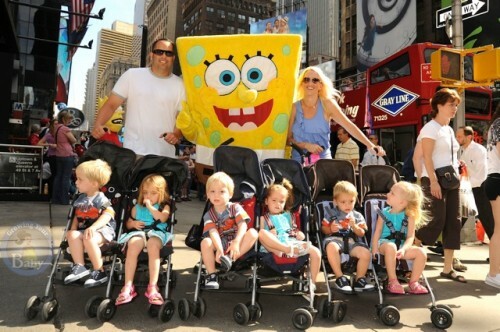 Home » The Masche Sextuplets Take Manhattan! Jenny and Brian Masche posed today with their sextuplets, Bailey, Savannah, Molli, Grant, Blake and Cole,now 2 and a half years old, as the crew took over the Times Square Hershey Chocolate Store during a trip to New York City. The Masches will return to WE tv with a new season of “Raising Sextuplets'” premiering June 30, 2010. Belfast sextuplets Brian Masche Jenny and Brian Masche Jenny masche masche sextuplets Multiple Births • Raising Sextuplets reality Television WE T.V.